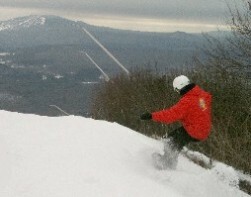 Bromley Mountain, Vermont, is removing the cost factor from that tricky trial period of learning to ski & snowboard. This season’s Start Fun, Start Free events have been set for December 21, 2014, January 19, 2015 and March 15, 2015, when up to 75 guests, ages 6 and up can enjoy a day on snow, free of charge. Registrants will receive an all-day Learning Zone lift ticket, an all-day Rental of ski or snowboard equipment, and instruction in the Learning Zone from 10:30am until noon. Call 802/824/5522 to pre-register. Following the “free” theme, Bromley is introducing the Super Duper Ski Package, partnering its Kidsrule Mountain Camps program with Elan skis. This $599 package includes 6 Kidsrule lessons, a free pair of Elan Starr skis with Quick Trick bindings, a coupon for great deals on boots, poles and accessories, plus a Bromley Season Pass! (The Season Pass isn’t new… since Kidsrule’s inception in 2011/12, every child that completes 6 Kidsrule lessons receives a full Season Pass.) The package saves $223 on lessons alone, the free skis retail for about $220, plus the value of a season pass (check bromley.com for the current rates). Limited packages available; click here for full details. Other new and exciting happenings in the Bromley snowmaking world include: Collaborating with HKD to develop a new design for a portable tower gun. One side-effect to surrendering the ground guns is a loss of flexibility in gun placement for tricky spots, steep spots, spots the tower guns just don’t go. In order to maintain portable options, 6 of the new tower guns will be just 6’ tall, mounted on a stable tri-pod (instead of a sled, like other portable tower guns) with specially developed nozzles to allow moisture coming out of these shorter guns the appropriate “hang-time” necessary for making good quality snow with tower guns. Is it possible to further maximize efficiency? In partnership with Efficiency Vermont, Vermont’s Sun Mountain plans to find out by installing the first Snowmaking Energy Index (SEI) in the United States this winter. This system will allow Bromley’s snowmakers to measure the effectiveness and efficiency of its snowmaking system in real time, giving its team the ability to adjust variables allowing for maximum output, best quality snow and lowest energy consumption possible at all times. Bromley is also the first resort in Vermont to install an Intelli-Flow Controller, giving the option to increase snow output by maximizing available air from the compressors based on real time environmental factors. For greater detail on snowmaking improvements, check Bromley’s snowmaking blog. Bromley Mountain is located at 3984 Vermont Route 11, Peru, Vermont, six miles east of Manchester. For information, visit bromley.com, 802-824-5522.